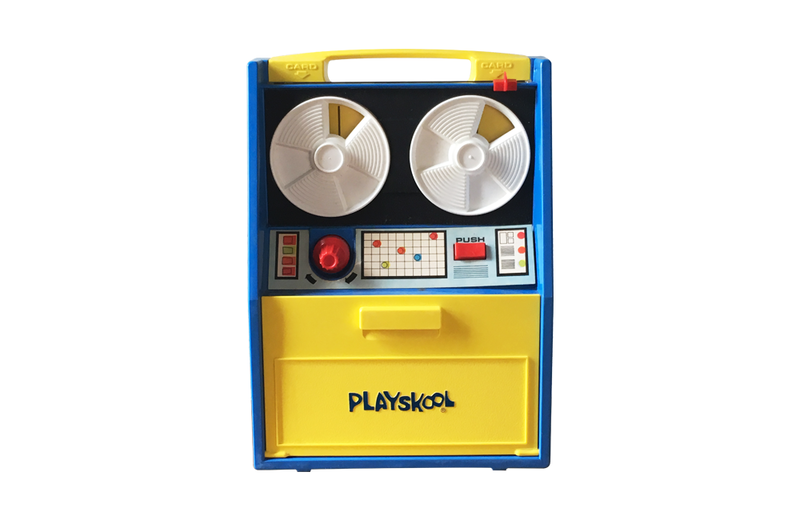 The Play ‘N Learn was entirely kid-powered, with no need for winding or batteries to operate. Playskool included six double-sided “programming” cards and a carry handle for portability. Kids inserted a card, then used the left dial to select a question and the right to select their corresponding answer. By pressing the red reply button, they could activate an internal mechanism that spun the right reel to the correct answer. Subjects on the programming cards included Matching Colors, Related Objects, Naming Colors, Part of a Whole, Matching Words, Matching Words to Objects, Matching Letters, Beginning Sounds, Telling Time, Rhyming Pictures, Adding Facts, and Rhyming Words. Kenner’s Movie Viewer was used to feature a variety of the company’s licensed properties, including Snoopy, The Six Million Dollar Man, The Bionic Woman, Star Wars and the movie Alien.